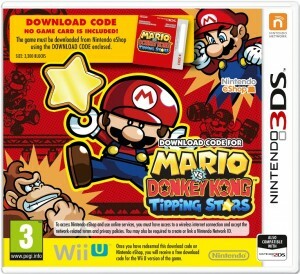 A few weeks back, Nintendo announced the first cross-play title to be made by the Big N. And as you may know, that title is Mario vs. Donkey Kong: Tipping Stars. 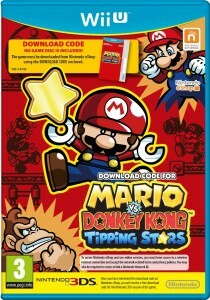 Continuing the series since the Gameboy Advance days, Tipping Stars sets to make a first by making an appearance on the console version. We’ve know got the official boxart for our European readers, which you can see below. What a marvelous mini-Mario! What do you think? Of course it’s a little tragic to see it’s just a download code for the game, but what do you think about the text sparssed all over the box? Would you rather just download directly from the eShop? Give us your thoughts in the comment section below.